New Orleans, renowned around the globe for its spectacular cuisine, among other charms, isn’t just about our Creole and Cajun heritage. Over the three centuries since the city was founded in 1718, emigrants, slaves, soldiers, suppliers, and settlers have shared their ethnicity– especially their culinary culture. While the city is acclaimed for the oldest, owned-by-the-same-family restaurant in the country, 175-year-old Antoine’s, and its sister French Quarter Grande Dame Creole restaurants, Galatoire’s, Broussard’s, and Arnaud’s, all around the 100-year-old mark, New Orleans attracts artisan chefs from all over the world who want to cook here. The area’s amazing cuisine is a tribute to all the cooks who worked together and shared their backgrounds, “found” ingredients, recipes, and skills, often without speaking the same language. As most chefs and diners alike have experienced, the language of food has its own way of communicating. 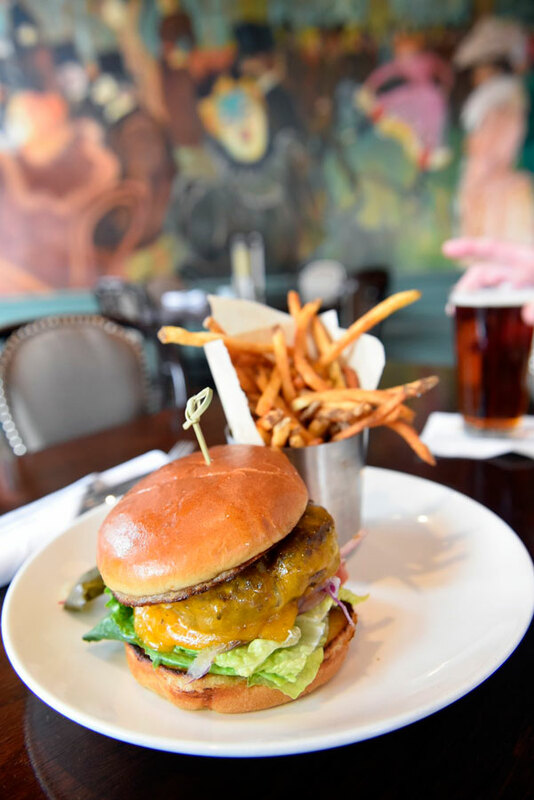 While we mention the acclaimed Grande Dame restaurants, there are so many fabulous dining venues throughout the city, especially in the French Quarter, that prepare fabulous, upscale, as well as simpler cuisine, served in a more casual setting. Curio, located in the upper French Quarter, is a new restaurant in a historical setting. The eclectic bistro is open for brunch on Saturdays and Sundays, and lunch and dinner daily. Curio also offers a mid-afternoon menu, Happy Hour libations, and bar bites on most week days. Kids’ menus are also offered for brunch, lunch, and dinner. General Manager Landon Labor and his team oversee the front-of-the-house while Executive Chef Hayley Vanvleet heads the kitchen operations. What comes out of that kitchen is nothing short of amazing! In addition, the service staff reaches for the stars in treating each and every diner with totally satisfying amenities and pleasantry. The place itself is a dining and bar venue with all the charm of renowned French Quarter architecture and decor. The two-story building opens to the corner of Royal and Bienville streets with a downstairs bar and sitting area for diners and other patrons. A curving staircase leads up to the 2nd floor with another larger dining room and a wrap-around covered, outdoor gallery with views of Royal and Bienville streets. The refurbished building is located among antique shops, art galleries, jewelers, and other businesses as well as residential dwellings. The building was home to an infamous curio shop during the late 1800s that catered to customers who collected curiosities from everywhere on the globe. In later years, the building served as a popular market and deli. 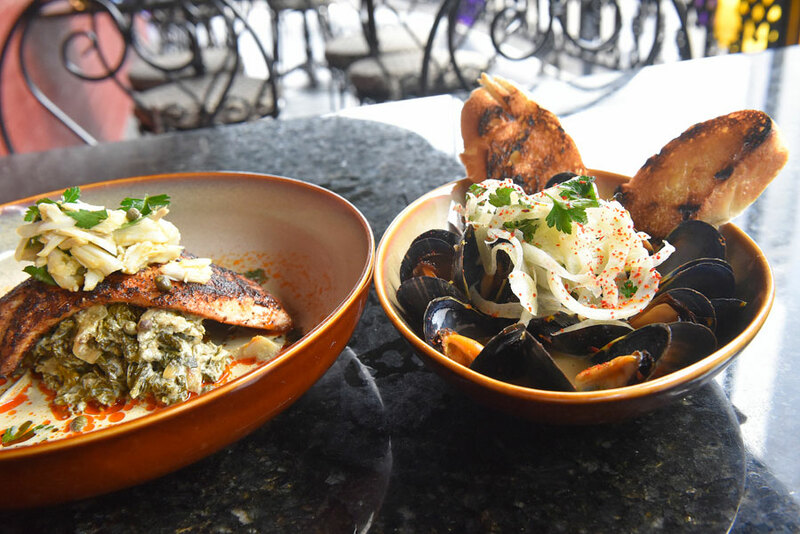 In addition to current deli offerings such as a Bistro Board with artisanal cheese, cured meat, roasted garlic, and seasonal fruit preserve, Curio covers the dining sphere from brunch to lunch-to Bric-a-brac afternoon choices, to dinner. The menus for lunch and dinner dishes offer an array of choices including candied fried pork ribs with brown sugar and cayenne glaze, sandwiches, burgers, grilled veggies, seafood preparations, sushi, salads, steak, and more. The legendary, late Chef Paul Prudhomme, of K-Paul’s Louisiana Kitchen fame, started a food revolution that swept across the U.S. from coast to coast with his Cajun and Creole creations some 40 years ago, and still going strong! His namesake restaurant founded with wife, K, continues today with Brenda Prudhomme-Miller and Executive Chef Paul Miller, who was one of Prudhomme’s culinary disciples. Miller is also from Prudhomme’s hometown in Louisiana’s Acadian country, Opelousas. 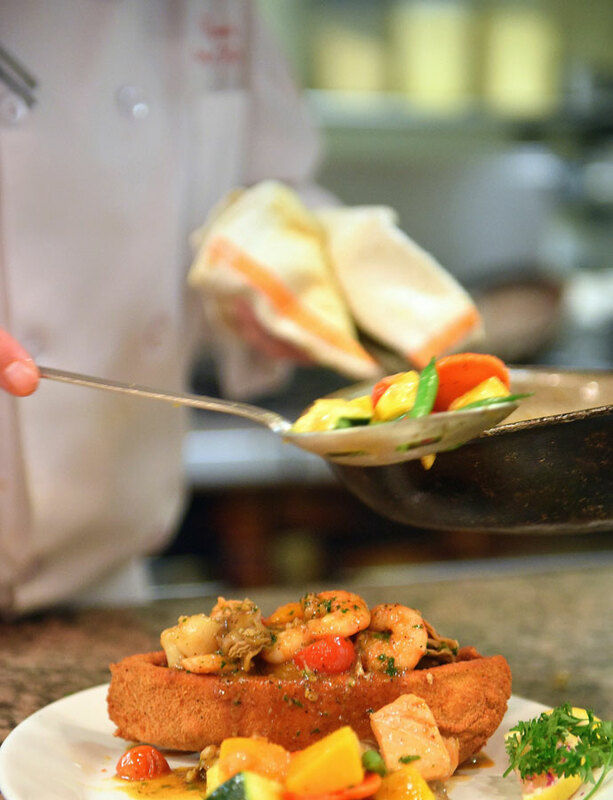 Chef Paul’s original recipes for divine cuisine remain on K-Paul’s lunch and dinner menus, along with some new creations that reflect the influence of Louisiana’s famously regional cuisines, Cajun and Creole. K-Paul’s offers lunch service Thursday –Saturday from 11 a.m. to 2 p.m., and dinner Monday-Saturday 5:30 p.m.- 10 p.m. Several of the most called-for dishes are available at both lunch and dinner. For example, K-Paul’s Chicken and Andouille Gumbo, and rich Turtle soups are two of the most appealing appetizers to patrons. Other favorites are Fried Green Tomatoes with Shrimp Chipotle Remoulade, and Fried Crab Fingers with spicy dipping sauce. However, all dishes noted are subject to menu changes based on seasonality and availability of fresh ingredients. Po-boys on toasty French bread are delicious, casual food--deep-fried crispy oysters, with oyster mayo; Louisiana fresh shrimp battered and fried with shrimp mayo; and roasted Creole sausage made from ground pork, chicken, beef and caramelized trinity, with marinara, sautéed onions, and sweet peppers. Some luscious entrée delights are more upscale including house-favorites Blackened Louisiana Drum, Blackened Stuffed Pork Chop Marchand de Vin, Duck and Shrimp Dulac in a sauce of leeks, sun-dried tomatoes shitake and oyster mushrooms and duck glaze served with pasta. Another dish that customers are requesting is Eggplant Pirogue with Seafood Atchafalaya, which showcases a deep-fried eggplant pirogue –a Cajun canoe-- filled with fresh Louisiana shrimp, bay scallops, crawfish, and sun-dried tomatoes in a garlic, parsley, emulsified seafood stock with rice and veggies. Many other delectable dishes are on the menu, so whatever comes from Chef Paul’s kitchen, just has to be fabulous! The Country Club is another exciting scenario for both casual and upscale dining! A lovely lunch with libations, crunchies with cocktails, dinner and drinks, brunch accompanied by bubbles or Happy Hour and Hurricanes are perfect combinations for both The Country Club’s sophisticated surroundings and the venue’s different style settings. A best kept treasure for more than 40 years, the Country Club is just a mile or so from the French Quarter in New Orleans eclectic, bohemian Bywater neighborhood. The Country Club encourages you to escape to its relaxed retreat. The 1884 built and renovated Italianate cottage houses the Club’s main restaurant, with a pool and cabana bar, along with outdoor seatings amidst beautiful foliage and a kitchen on the grounds. 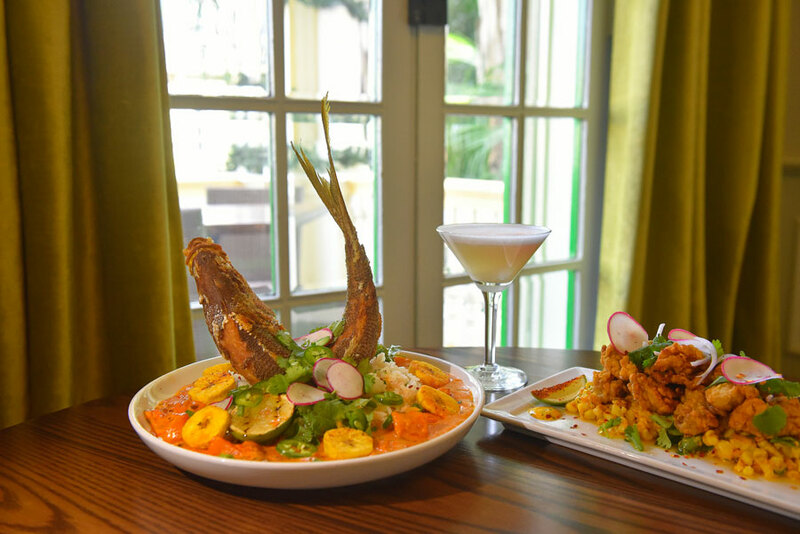 Top notch Executive Chef Chris Barbato– formerly a Commanders Palace sous chef, and his team, has pulled together menus of exquisitely delicious dishes and drinks. Lunch and dinner are served daily. Lunch starters include scrumptious Crab Beignets; Lox and Bagel; Shrimp and Tasso au Gratin; Crab and Coconut Bisque; Truffle Mac-n-Cheese; and Crispy Gulf Oysters with Saxon Mayo, crushed lime, cilantro roasted corn, and Parmesan. Among entrée choices offered are ½ lb. Angus Hamburger dressed on brioche with house-cut fries; Crispy Whole Fish with an intense Caribbean stew with carrots, yellow curry, plantains, yucca, charred poblanos and Louisiana popcorn rice; Char-Grilled Flank Steak with smothered potatoes, caramelized onions, Brussels sprouts, fire-roasted tomatoes and roasted garlic jam; and B.E.A.T. with bacon, fried eggs, smashed avocado, arugula, and tomatoes on brioche. Dinner entrees selections include Saffron Mussels steamed in white wine with toasted garlic, chile flakes, sweet peppers, rapini, and Spanish Saffron; Duck Fat Roasted Chicken; Pan Roasted Louisiana white Shrimp; Creole Mustard Braised Rabbit Stracci with house made pasta; Char Grilled Lamb T-Bones; 18 oz. Chateaubriand (for two); Chile Spiced Flank Steak; and Crispy Whole Fish. The Country Club also hosts an incredibly delightful brunch on the weekends. Check it out! The Faubourg Marigny, located between the French Quarter and the Bywater neighborhood, was New Orleans first suburb, circa early 1800s. Today, Frenchmen Street is the main thoroughfare and “hip strip” that people flock to for the enjoyment of multiple music clubs, casual dining, busy bars, and artsy décor. One of the first restaurants to open on Frenchmen that drew huge crowds – and still does-- is the Praline Connection, the brainchild of Curtis and Gloria Moore and partner Cecil Kaigler. Sadly, Gloria has left us recently, but her spirit and style will always be a part of the restaurant and the Marigny. More than 25 years ago the trio saw the need for a home-cooked food delivery business for working mothers with children. 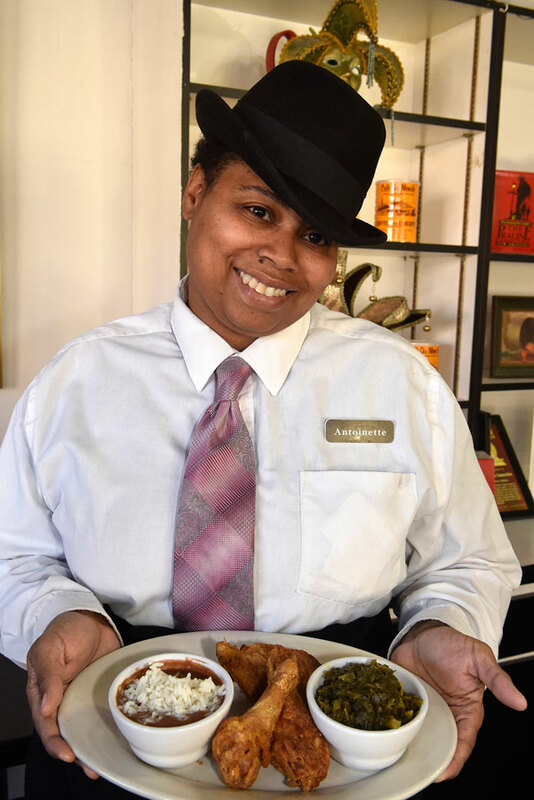 The service was so well received that the partners couldn’t keep up with the demand, so they decided to open the restaurant and candy store on Frenchmen. From the very beginning the partners focused on the three cuisine styles associated with New Orleans culinary heritage – Creole, Cajun, and Soul. Always working with the best and freshest ingredients, the Praline Connection’s kitchen has made friends and found followers all over the world. Just a taste of any of these favorites from regulars, Crawfish or Shrimp Etouffee; Spicy Chicken Wings; Fried Okra; Bite-Sized Catfish; File Gumbo; Fried Oysters plate; Baked, Fried or Stewed Chicken; Stuffed Crab plate; Stuffed Bell Pepper with ground beef and shrimp; BBQ Ribs; Jambalaya with a side of greens; Seafood Combo platter; Spaghetti and Meat Balls. Also, “A Taste of Soul” platter; Classic Po Boys; Beans and Rice; Meat Loaf; Smothered Pork Chop; Turkey Necks or Wings; Chicken Livers with Gravy; Greens and Beans and so many other treats, is bound to steal your heart. Don’t miss the desserts. Enjoy!